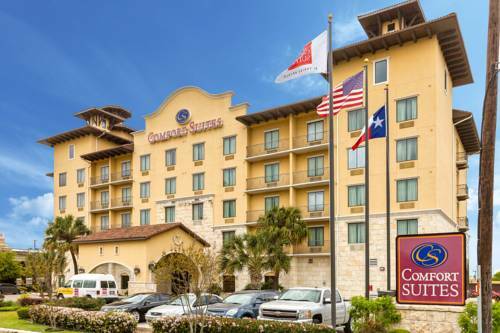 Get more of the space you need to spread out, relax or work at the smoke-free Comfort Suites Alamo/River Walk hotel in San Antonio, TX. Other nearby activities and sites include Lackland Air Force Base, Fort Sam Houston, ATandT Center and the Alamodome. Visitors can also easily get to the Henry B Gonzalez Convention Center and the San Antonio Zoo. Enjoy free hot breakfast, free WiFi and an outdoor heated pool. Your spacious suite offers 25 percent more space than the traditional room and amenities like a TV, fridge, microwave, coffee maker, sofa sleeper and recharge device. Also, earn rewards including free nights and gift cards with our Choice Privileges Rewards program. Parking Charge: 15.00 per day per car and 50.00 per day. Hotel only accepts credit cards. No debit cards are accepted. - Henry B. Gonzales Conv. Ctr.